Until the end of April, my time and creative energy will mostly (though not exclusively, thanks to a successful Dance on the Box application of which more quite soon) be consumed by Open Niche. After I made Niche in 2008, I knew I wanted to continue the life of the piece and to share it with different venues around the country, but it didn’t feel right that a piece made in response to a particular moment and a particular environment in what we now know as pre-crash Dublin, should be transplanted to various locations around the country. The piece was responsive. It’s structure is adaptive, as the performers alter their performances in sensitive response to each other and to the audience that shares the experience with them. So instead of doing a regular tour where financial efficiency requires a quick get in, perform and get out, I sought (pre-crisis) Arts Council support to develop a different model of engagement. 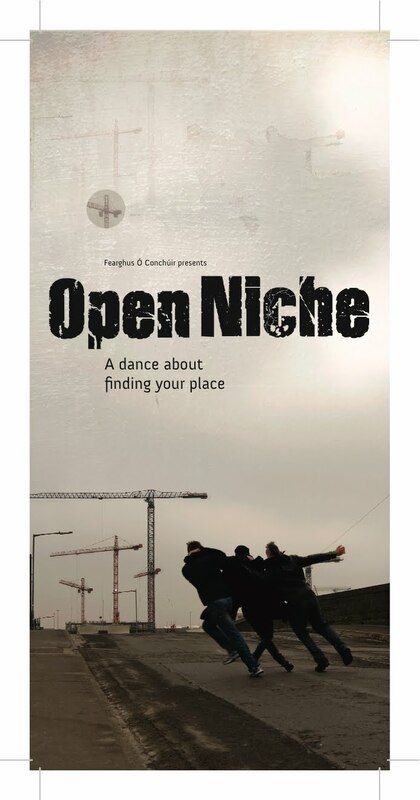 So for Open Niche, I am working with dancers from each of the five locations where we will perform: with the Dublin Youth Dance Company for the Pavilion show in Dun Laoghaire, with MA students at UL and DMPs for the Limerick performance, with the Siamsa Tíre core company for the Tralee performance and with local dance enthusiasts for both the Firkin Crane (Cork) and Hawk’s Well (Sligo) shows. I will make material with each of the groups and integrate it in to the show making a performance unique to each venue. I’m hoping that this process will help Niche and me to learn something about each of the places we visit rather than coming as a closed, pre-packaged event. The challenge to me and to my work is whether the structure I bring is resilient enough to be generous. Can it make space within it for the new elements? This is a personal challenge for me and for the wonderful Niche dancers who will need to maintain the architecture of the piece while responding to the new inhabitants within it. I’m hoping also that this process of being open to local influence will make it easier for local audiences to engage with the work. And I’m trying to create a situation whereby my spending more time in each place to make these new pieces of material means I am more available to help the venues with the marketing and publicity.